With so much interest in the new, quiet, Stoeger X20S Suppressor air rifle, I've been asked many questions about its performance. 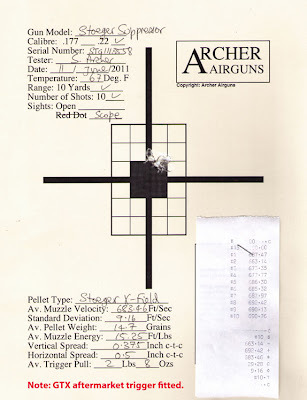 So, this post gives a review of the "real world" performance test data we have captured during Archer Airguns Gold Service testing of the .22 caliber model. Make no mistake, this is very good performance for an air rifle of this type and price, particularly when combined with the excellent accuracy and quietness of the X20S Suppressor - as this test target shows! This Gold Service test target - shot with Stoeger X-Field lead pellets - gives a good indication of the performance you can expect to see from a typical "dry" gun. Note that the domed pellets do not make clear "cut out" holes in the card target, but you can still see that they made a good group. This gun was fitted with a GTX trigger, hence the lower pull weight, otherwise, this performance was given by a fairly "dry" gun, new and in factory condition. For those unfamiliar with the technology of spring-powered air rifles such as the Suppressor, I'll explain the "dry" comments..
All air rifle manufacturers use oil when assembling guns - as you would expect. But the amount applied varies from individual gun to gun. In any spring-powered air rifle, this oil will be literally burned due to the extreme air pressures generated by spring-powered air rifles when firing. The oil literally "Diesels"! This dieseling effect increases both the muzzle velocity of new spring-powered air rifle and the variability of muzzle velocity from shot-to-shot (known as Standard Deviation). 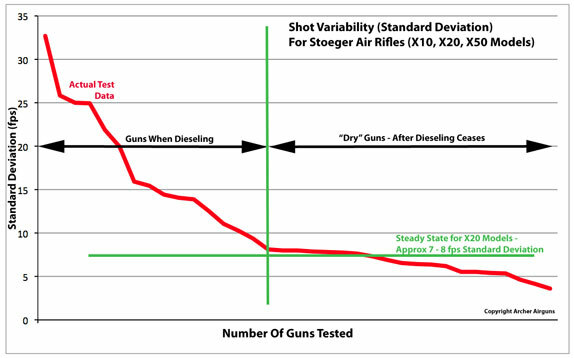 Archer Airguns extensive Gold Sevice test data shows that - on average - the standard deviation of a spring-powered air rifle falls as the dieseling subsides: the oil from assembly is burned away by continued shooting until the gun becomes "dry". As we test hundreds of new air rifles, we inevitably find some that are already quite "dry" from the factory, while others diesel significantly. Reviewing and analyzing this data allows us to plot the Standard Deviation range for a particular type of air gun. This data indicates that the Standard Deviation for "dry" X20 air rifles is about 7 - 8 fps. This is a very good figure! 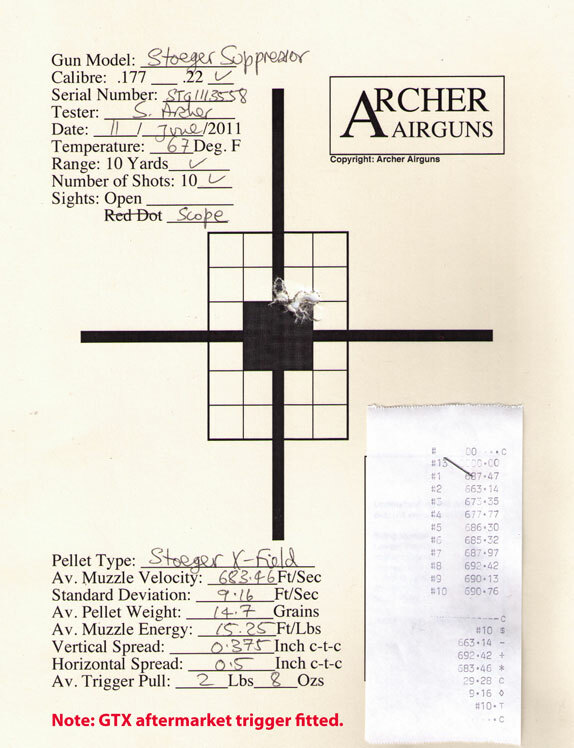 Here's a graph of this test data for all Stoeger X10, X20 and X50 air rifles. By reviewing this performance data, we can set the baseline Standard Deviation for a dry X20S Suppressor at about 7 - 8 fps. 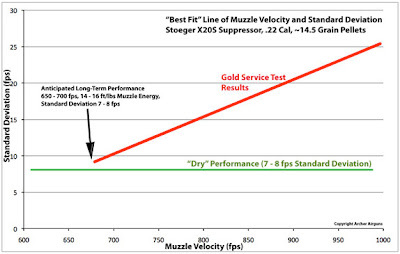 Then by plotting actual Gold Service test results of muzzle velocity against Standard Deviation and generating a "line of best fit" we see the long-term performance expectation from the following chart. And one other thing about dieseling. As it decreases, the air rifle shoots more accurately (as we've demonstrated with other Gold Service test data on the QB57 air rifle and published elsewhere in this blog). So, your gun will also shoot more accurately over time as it dries out. So that's how we derived our long-term, real-world performance data expectations for the Stoeger X20S Suppressor. It's based on data from testing many guns to achieve an average. Of course, like any average, "your mileage may vary"! I hope this review gives a good indication of what you can really expect from this excellent, quiet, air rifle. You can buy the Stoeger X20S Suppressor from our store and have it fitted with the improved GTX trigger too - it's a great performance package for quiet plinking and hunting small game.